Pupillary responses (light reflex) were measured for assessment of adequate seizure induction by electroconvulsive therapy using an automated infrared pupillometer immediately after electrical stimulation. Constriction ratio was calculated and compared with seizure quality. Shirozu, K., Murayama, K., Yamaura, K. Pupillary Response as Assessment of Effective Seizure Induction by Electroconvulsive Therapy. J. Vis. Exp. (146), e59488, doi:10.3791/59488 (2019). Electroconvulsive therapy (ECT) is reported to be effective for severe neuropsychiatric disorders. In ECT, electrical stimulation is applied to the brain, inducing seizure activity. 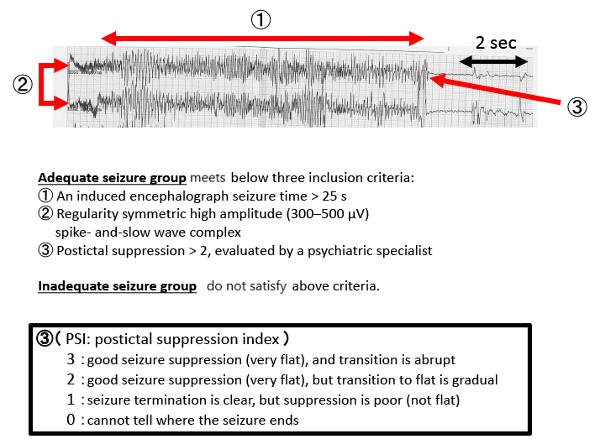 Adequate seizure induction with ECT is associated with seizure duration, symmetrical high amplitude waveforms during slow-wave activity, postictal suppression, and activation of the sympathetic nervous system. Sympathetic nervous system activation is influenced by anesthetic agents or cardiovascular drugs during ECT. Pupillary responses can reflect sympathetic nervous activity or the degree of brain damage. Pupillary response measurement can be conducted in a simple, precise, and objective way using an automated infrared pupillometer, enabling the measurement of pupil diameter (mm) to two decimal places. The white light used for measuring light reflexes is not overly bright, and patients do not typically report discomfort. Pupillary light reflexes were measured before anesthesia induction and immediately after electrical stimulation using this equipment. Pupil diameter is typically enlarged after brain damage or sympathetic nervous activation. Adequate seizure induction using ECT could induce pupillary enlargement immediately after electrical stimulation. In the current method, the constriction ratio of pupil size was calculated automatically and compared with seizure quality. Pupillary responses immediately after electrical stimulation may provide a useful assessment of the efficacy of seizure induction with ECT. Electroconvulsive therapy (ECT) is considered an effective treatment for severe neuropsychiatric disorders, including refractory psychosis, bipolar disorder, and depression1. In ECT, an electrical current is applied to the brain to induce a seizure under general anesthesia2. Although the mechanisms underlying ECT remain unclear, its antidepressant effects have been attributed to seizure-induced changes in neurotransmitter levels, improved neuroplasticity, increased functional connectivity, and an increase in the plasmatic production of brain-derived neurotrophic factor3. It has also been reported that ECT facilitates serotonin-, norepinephrine- and dopamine-mediated neurotransmission4. These findings suggest that ECT could cause activation of the sympathetic nervous system. Previous studies have evaluated adequate seizure induction by ECT using seizure duration, symmetrical seizure amplitude, postictal suppression, and activation of the sympathetic nervous system4,5. Among these factors, increased activation of the sympathetic nervous system cannot be measured using electroencephalography. Detection of sympathetic nervous system activation is dependent on increased blood pressure (BP) and heart rate (HR). However, these hemodynamic parameters do not always reflect sympathetic responses because of the administration of antihypertensive drugs to prevent cardiac events during ECT and anesthetic agents, which affect sympathetic nervous function. Pupillary responses can reflect the degree of brain damage6. Thus, pupillary mydriasis is indicated for severe brain damage6. Artificial seizures induced by electrical stimulation constitute an abnormal state of brain activity. Thus, evaluating the pupillary response immediately after ECT may be useful for assessing the efficacy of ECT because ECT may also influence pupillary responses7. However, measuring pupillary responses in busy clinical situations, as in the current case, is often difficult. To address this issue, a measurement method using an infrared quantitative pupillometer could help to measure pupillary responses easily, accurately, objectively and reproducibly. Quantitative pupillary assessment methods are superior to those obtained manually at the bedside, even by experienced nurses and physicians8. The proposed method for measuring pupillary reactivity using an automated infrared pupillometer could be useful for detecting the degree of seizure or sympathetic nervous activation. In a previous study, we reported that the pupillary light reflex was related to the efficacy of seizure by ECT9. Specifically, we found that pupillary diameter was not changed after light stimulation, remaining enlarged when adequate seizure was induced. Thus, the aim of the proposed method is to measure the light reflex using an automated infrared pupillometer immediately after electrical stimulation. The proposed method is easy to perform, enabling any clinician, not only psychiatrists, to evaluate the efficacy of seizure induction using ECT. The study protocol was approved by the institutional clinical research ethics committee of Kyushu University, Fukuoka, Japan (IRB: Clinical Research number #28-77). Although the measurement of pupillary reaction is an essential and standard clinical procedure during anesthesia, informed consent was obtained for this research. Patients with cataract, glaucoma, intraocular lenses, or insulin-dependent diabetes mellitus were excluded because their pupillary responses may be abnormal. Clean the right and left forehead and area behind the ears with an alcohol cotton swab, and then attach electroencephalogram (EEG) monitors at four symmetrical points. Clean bilateral temples with normal saline, and then attach adhesive electrical stimulation pads (about 4 cm x 5 cm) to the bilateral temples to prevent interference in the stimulation due to hair. The intensity of stimulation is changed each time, according to the previous degree of inducted convulsion. Attach electrocardiogram (ECG) monitors at two points on the chest (base of the heart and cardiac apex) and monitor heart rate. Prepare a tourniquet and belt it at the left thigh. NOTE: The tourniquet is belted until 200 mmHg after the patient is asleep. Convulsion induced by ECT can be observed in the lower leg even after systemic administration of muscular relaxant. Attach two electromyogram sensors to the left anterior tibial muscle, with a distance of 5 cm, to measure generalized seizure time in the lower leg. NOTE: All patients underwent ECT in the same room, at the same time of day. After the forehead is cleaned with an alcohol cotton swab, attach a bispectral index (BIS) measurement device to the patient’s forehead. BIS is used to monitor depth of anesthesia. Non-invasively measure blood pressure at the arm every 1 min during ECT therapy. Continuously monitor saturation of oxygen and pulse rate by a clip attached to the finger. Hold a pupillometer (see the Table of Materials) over one of the patient’s eyes. After the patient opens their eyes, press a button (Figure 1A) on the pupillometer, and measurement starts automatically. Maximum (initial) resting pupil size (MAX) and minimum pupil size after light stimulation (MIN) are automatically measured, and the constriction pupil size ratio (%constriction = [MAX–MIN]/MAX expressed as a percentage) is automatically calculated. NOTE: The duration of light emission is 800 ms, and the required data can be obtained within 1 second. If the patient is unable to keep their eyes open, the examiner assists by holding the eyelid open. Although anesthetists typically measure the pupillary diameter or light reflex of patients before surgery in the operating room, cooperation with patients is needed before anesthesia induction. Supply oxygen (6 L/min) via a mask. Administer propofol (sedative: 3 µg/mL, target controlled infusion) via intravenous line until loss of consciousness. Tighten the tourniquet belted at the thigh to 200 mmHg. Administer succinylcholine (muscle relaxant: 1 mg/kg) via the intravenous line. After spontaneous breathing of patients ceases, have the anesthesiologist perform controlled ventilation using a face mask with 100% oxygen without intubation. Perform ventilation from the point at which end-tidal carbon dioxide is 30 mmHg until electrical stimulation10. After BIS value begins to increase, the anesthesiologist stops ventilation and psychiatrists start the ECT procedure. Conduct ECT via bitemporal electrode stimulation using an ECT instrument. Set the initial electrical stimulus dose (%) at half the value of each individual’s age. NOTE: Maximum stimulus dose is 100%. The electrical stimulation time is about 7-8 s.
Immediately after electrical stimulation, hold thr automated infrared pupillometer over one of the patient’s eyes. At this time, if the patient closes their eyes, keep the patient’s eyelid open. Press the device button, as in step 2.4, and measure maximum (initial) resting pupil size (MAX) or minimum pupil size after stimulation (MIN). Perform controlled ventilation using a face mask with 100% oxygen until the patient begins breathing spontaneously. Using EEG, measure ictal regularity, seizure time and greater postictal suppression (by the psychiatrist [Figure 2, Figure 3]). Portable pupillometer devices are produced by several companies. These devices are typically conveniently sized and can be operated with one hand (Figure 1A), enabling examiners to accurately detect pupillary responses by pressing a button. Infrared light is used to detect the pupillary edge automatically (Figure 1B), accurately representing pupillary data (Figure 1C). This device measures maximum (initial) resting pupil size (MAX), minimum pupil size after stimulation (MIN), constriction pupil size ratio (%constriction, [MAX-MIN]/MAX expressed as a percentage), latency duration (LAT, time between initiation of retinal light stimulation and onset of pupillary constriction), constriction velocity (CV, extent of constriction/duration of constriction), maximum constriction velocity (MCV), dilation velocity (DV, extent of pupil size recovery/duration of recovery). The light reflex is acquired using a flash of visible white light of 800 ms duration at the start of each 3.2 s scan11. We report the relationship between the pupillary response and efficacy of ECT using this device among 13 patients (Figure 3, this figure has been modified from reprinted from Shirozu et al.9. As shown in Figure 3A, pupillary diameter was increased after electrical stimulation. However, significant differences in constriction by the light reflex were caused immediately after electrical stimulation, reflecting differences in seizure efficacy induced by ECT (Figure 3B). Figure 1: Automated infrared pupillometer. (A) The measurement method. (B) Detecting the edge of the pupil. (C) Representing the pupillary data. The images are presented with the explicit permission from the commercial supplier. Please click here to view a larger version of this figure. Figure 2: EEG results during a typical seizure. Please click here to view a larger version of this figure. Figure 3: Pupillary response changed immediately after electrical stimulation. (A) Maximum pupil diameter. (B) Pupillary constriction ratio (light reflex). We used two-way ANOVA for comparisons between adequate and inadequate seizure groups at control, and just after stimulation. Adequate seizure status was determined using the criteria described above. Data are presented as mean ± standard deviation. Sidak’s multiple-comparison post hoc test was utilized for two-way analysis of variance. ***p < 0.001, ****p < 0.0001. This figure has been modified from reprinted from Shirozu et al.9 with permission. Please click here to view a larger version of this figure. Automated infrared pupillometer devices have been used to measure pupillary reactions in clinical situation12. However, to our knowledge, no previous studies have used this equipment for detecting the efficacy of seizure induction by ECT. Resting pupil diameter size differs between patients, but constriction ratio provides an objective measure. Thus, we selected the constriction ratio change, not the diameter size change. Additionally, small changes of pupillary diameter can only be measured using an automated infrared pupillometer. Several important factors should be considered in applying this method. Pupillometer measurement should not be used in patients with ophthalmic lesions because pupillary reflexes may be altered as compared with normal patients. Pupillary reactions are influenced by environmental light and time of day, these factors should be kept uniform across patients. Although anesthetic agents and psychiatric drugs have also been found to affect pupillary reaction,9,13 these treatments did not affect the results in our previous report9. The efficacy of ECT has been evaluated based on electroencephalography and increases in BP or HR. This method is widely used, and has been evaluated in many previous studies. However, an increasing number of patients have adapted to ECT, and rates of cardiovascular disease are increasing. Thus, it is important to prevent abnormal hypertension. The proposed method might be particularly useful for patients who have been administered antihypertensive drugs during ECT. Pupillometry can be used to measure constriction velocity after constriction by light stimulation, and further details regarding the relationship between pupillary reaction and efficacy of ECT should be examined in future studies. These studies may reveal valuable information about the relationship between the efficacy of ECT and pupillary reactions at time points other than immediately after electrical stimulation. Hemodynamics are substantially changed immediately after electrical stimulation. Then, measurement should be conducted immediately after electrical stimulation because pupillary reactions recover rapidly. Thus, pupillary reaction measurement should be conducted by a person other than the responsible anesthesiologist, and the method requires cooperation with a psychiatrist or nurse. Thymatron IV system Somatics Inc.
Saito, S. Anesthesia management for electroconvulsive therapy: hemodynamic and respiratory management. Journal of Anesthesia. 19, (2), 142-149 (2005). Ward, H. B., Szabo, S. T., Rakesh, G. Maintenance ECT in schizophrenia: A systematic review. Psychiatry Research. 264, 131-142 (2018). Milev, R. V., et al. Canadian Network for Mood and Anxiety Treatments (CANMAT) 2016 Clinical Guidelines for the Management of Adults with Major Depressive Disorder: Section 4. Neurostimulation Treatments. Canadian Journal of Psychiatry. 61, (9), 561-575 (2016). Vutskits, L. General Anesthetics to Treat Major Depressive Disorder: Clinical Relevance and Underlying Mechanisms. Anesthesia & Analgesia. 126, (1), 208-216 (2018). Nishikawa, K., Yamakage, M. Effects of the concurrent use of a reduced dose of propofol with divided supplemental remifentanil and moderate hyperventilation on duration and morphology of electroconvulsive therapy-induced electroencephalographic seizure activity: A randomized controlled trial. Journal of Clinical Anesthesia. 37, 63-68 (2017). Ritter, A. M., et al. Brain stem blood flow, pupillary response, and outcome in patients with severe head injuries. Neurosurgery. 44, (5), 941-948 (1999). Kobayashi, K., et al. Rapid and lasting enhancement of dopaminergic modulation at the hippocampal mossy fiber synapse by electroconvulsive treatment. Journal of Neurophysiology. 117, (1), 284-289 (2017). Meeker, M., et al. Pupil examination: validity and clinical utility of an automated pupillometer. Journal of Neuroscience Nursing. 37, (1), 34-40 (2005). Shirozu, K., et al. The relationship between seizure in electroconvulsive therapy and pupillary response using an automated pupilometer. Journal of Anesthesia. (2018). Sawayama, E., et al. Moderate hyperventilation prolongs electroencephalogram seizure duration of the first electroconvulsive therapy. JOURNAL OF ECT. 24, (3), 195-198 (2008). Rollins, M. D., Feiner, J. R., Lee, J. M., Shah, S., Larson, M. Pupillary effects of high-dose opioid quantified with infrared pupillometry. Anesthesiology. 121, (5), 1037-1044 (2014). McNett, M., Moran, C., Janki, C., Gianakis, A. Correlations Between Hourly Pupillometer Readings and Intracranial Pressure Values. Journal of Neuroscience Nursing. 49, (4), 229-234 (2017). Shirozu, K., et al. The effects of anesthetic agents on pupillary function during general anesthesia using the automated infrared quantitative pupillometer. Journal of Clinical Monitoring and Computing. 31, (2), 291-296 (2017).